Mikey Garcia is the underdog and will have deck stacked against him when he steps inside the ring at AT&T Stadium in Arlington, Texas Saturday night against IBF welterweight titleholder Errol Spence. It’s a situation he’s had to get used to his entire life growing up in the working class city of Oxnard, California. Whether it was training as a young boy at the famed La Colonia Gym or now near his home in the Los Angeles suburb of Moreno Valley, Garcia has never backed away from a challenge. Spence may be a different challenge though. The southpaw fighter from DeSoto, Texas has demonstrated speed, precision and power in becoming a world titleholder and likely the best fighter currently in the welterweight division. A fight against Spence could be a career-defining fight or a career-ending one for Garcia, who will attempt to win a world title belt in his fifth different weight class. The Garcia-Spence fight will headline a four-bout bill. 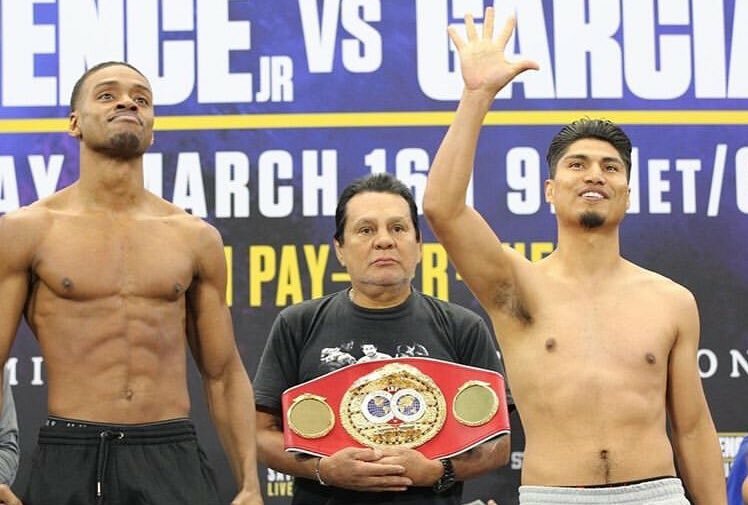 At Friday’s weigh-in, Spence weighed in at 146.25 pounds. Garcia weighed 145.5 pounds. Garcia (39-0, 30 knockouts) enters a weight class (for now) that is very competitive and talented. Whether Garcia stays at 147 pounds, win or lose, remains to be seen until after the fight. The 31-year-old Garcia has received props for stepping in to face Spence when it has appeared some of the welterweights in the division have balked at squaring off against Spence. Garcia has not had a knockout since his highlight-reel one-punch knockout victory over Dejan Zlaticanin in January of 2017. Garcia does not think much of the notion he has to win by knockout or that Spence’s power will be too much for him. “I don’t know how he will respond to my power,” Garcia told The Ring last Saturday night in Carson, California. “We’ll find out next Saturday night. I don’t know what power he has. I believe that my boxing skills are more than enough. I can do a lot of things. I’m prepared to do whatever it takes to win this fight. Older brother and trainer Robert Garcia agrees. “All he has to do is fight smart. Spence is the bigger man and it’s a different weight division. It’s not that easy to hurt someone, especially coming up from lightweight. Garcia does have the advantage of fighting on big stages and being exposed to the limelight when older brother Robert fought years ago. So far, Garcia has proven naysayers wrong that he would not be the same fighter following his absence from the ring following a two-and-a-half-year layoff to deal with his lawsuit with Top Rank. Instead, he has thrived to become one of the best fighters in boxing today. Garcia has taken it all in, but he does admit the dreams he had as a small boy were not anywhere near where he is today. “When I was little, I didn’t imagine being where I’m at,” said Garcia, who made his pro debut in 2006. “Once I came back from that two-year layoff, I knew exactly where I wanted to be. Garcia is already an elite fighter, but a convincing win over Spence could make Garcia a household name, even amongst casual boxing fans. Even he falls short, Garcia has proven he is willing to accept tough challenges against some of the best fighters in boxing today. That may be the reason why some favour Garcia, as he has yet to lose and may be too clever for Spence. Aside from the family name, Garcia wants to build upon his legacy in the sport. “When I first became a champion (at 126 pounds), I wanted to fight the best. I wanted to unify world title belts at any opportunity.